Announcement Spring Clearance Sale - Buy any 3 regularly priced items, get 25% off of your entire order. Also, all items in the Clearance bin are 30% off!! Spring Clearance Sale - Buy any 3 regularly priced items, get 25% off of your entire order. Also, all items in the Clearance bin are 30% off!! They look great in my cubicle!! The cutest! Perfect for adding a little something special to our decorations. Thank you! This is my favorite new designer mat in my fancy photo frames line!! I’m star struck!! Beautiful new neutrals set posted today, check out the shop for many more!! 25% off when you buy 3 or more sets, take care of your coworkers/teacher gifts today!! Beautiful new wine charms just posted on the shop!! These will make great small holiday gifts!! I've never been a "crafty" one... until recently. I was sitting around one day thinking how bored I was watching the same Seinfeld episodes over and over again on sindication (and don't get me wrong, it's probably one of the best shows of all time! :)). Then I thought, Why not make pretty flowery things that you can use inside! Spruce up an otherwise ho-hum office or kitchen with some super cute flowery accents! 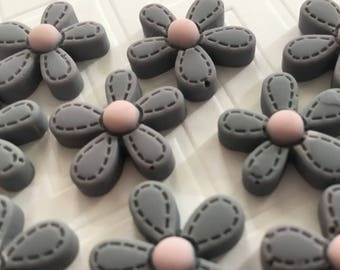 This thought process eventually evolved into what you now see on my shop... a pluthera of lovely flower magnets and thumbtacks which I am absolutely in love with!!! :) I hope you like them too! Then I started getting so busy with everything (I still have a full time job as a Catering Account Executive for a national casual dining restaurant!! ), I have asked my mother to collaborate! Together we run EbidebAndMe, and participate in local craft fairs. It is great to have a hobby we can do together! I am constantly on the look out for new flowers, colors, and patters, and am always adding new things to the shop. Be sure to check back often for new things to beautify your life! :) Don't hesitate to reach out if you have a special request or are looking for a custom item!